The book BlogTalks [Euro 16,80] is available via Libri or Amazon.de and other catalogues or your local bookstore, it is produced on demand, there is no stock. If you have trouble to get the book try to contact hidden-email:[email protected] (they read English) or hidden-email:[email protected] the latter is especially apt for research libraries. 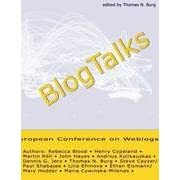 BlogTalks 2.0 is available at Amazon.de or at Libri or at your bookstore. ISBN=3901806741. If you have trouble in getting the book try to contact hidden-email:ohpuunaqry-qverxg#obq.qr? (they read English) or hidden-email:freivpr#uneenffbjvgm.qr? the latter is especially apt for research libraries.